Flan is a delicate baked caramel custard dessert, popular in Mexico and South and Central America. When flan is done correctly, it’s absolutely the most heavenly dessert you’ve ever tasted. When it’s done wrong, it’s miserable (something akin to sweet overcooked scrambled eggs). My husband John was very vocal flan-hater (he used to call it “egg pie”), until he tried this flan. Seriously. After he took a bite of the slice pictured below he said, “WOW … I think this could be my favorite dessert!” So even if you think you don’t like flan, you might want to give it another chance! 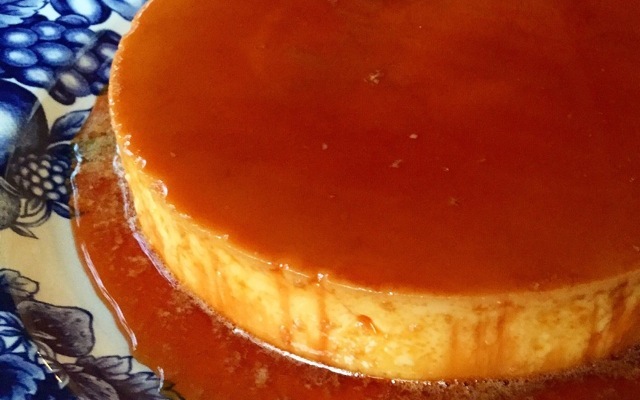 So how do you make REALLY GOOD flan? To make really good flan, there are a few things you need to know. First, how to cook the caramel sauce. Second, the proper flan pan to use. And third, how to cook the flan in a water bath. We’ll go over each point below. The caramel sauce that goes with the flan custard is made of cooked sugar. Sounds easy enough, right? It is. But, sugar burns really easily and it gets scalding hot as it cooks. So here’s what you need to know about cooking the sugar: Keep it on medium-low or low heat at all times, stir frequently and watch it constantly. As is explained in the instructions below, you’ll start by pouring 1/2 cup white granulated sugar into a small saucepan over medium-low heat. As the sugar cooks, it will start to melt, turn a light brown, and form clumps. You need to stir it frequently (almost constantly) at this point to keep it from burning. Eventually (after about 3 or 4 minutes or so) the sugar will completely liquify and turn a deep caramel color. At that point, the sugar is done cooking and is ready to be poured into the flan pan. Be very careful because the caramel will be VERY hot at this point. Also, the caramel will harden as it cools, so you need to work quickly when transferring it to the flan pan. While it is possible to make flan in various types of pans (for example, a 9-inch round cake pan or in individual ramekins), I’ve found the easiest way to make flan is to use a special flan pan called a “flanera.” You can buy a flanera on Amazon for about $12. This flanera is my favorite. If you like flan, the pan is a worthwhile investment. The locking lid will hold in the steam necessary to cook the flan, and it also makes transport of the finished flan super easy. The depth of this particular pan is also just right for my recipe (below). In order to cook a flan evenly throughout, you need to bake it with the custard in a flanera and the flanera in a “water bath.” Does that sound scary? It’s not. To make a water bath, you simply place the sealed flanera in a large metal or pyrex baking dish, and then add water to the baking dish. (The water should reach about halfway up the flanera, and the flanera should not float.) To bake the flan, you place the baking dish (with water and flanera inside) into the oven and bake at 350 degrees for 1 hour and 15 minutes. Just remember: the water and both pans will get very hot, so be careful and use potholders when removing them from the oven. Once you have the proper flan pan and understand how to cook the caramel sauce and make the water bath, making flan is quick and easy. I hope you’ll try it! It’s definitely my go-to dessert of late. I love to serve it with a big spoonful of sweetened vanilla-bean whiskey-spiked whipped cream (just add a splash or two of whisky, sugar, and vanilla bean paste to heavy whipping cream and whip as usual) … the whisky flavor goes just perfectly with the silky custard and sweet caramel! Pour the condensed milk into the jar of a blender. Fill the same can with milk, and pour the milk into the jar of the blender. Add the eggs. Blend for 30 seconds and set aside. To make the caramel sauce, pour the sugar into a small saucepan on the stove. Turn heat to medium-low. Continue cooking and stirring the sugar until it is completely caramelized—i.e., light brown and melted. Pour the caramel into the flan pan. Use a potholder to hold the flan pan because the hot sugar will make the pan VERY HOT. Using your spatula (while still holding the flan pan with a potholder and your other hand), spread a thin layer of caramel around the bottom and sides of the pan. This will keep the cooked flan from sticking to the sides. You need to work quickly because the sugar hardens as it cools! After the sides are lightly coated, let the remaining caramel cover the bottom of the pan. Blend the milk and egg mixture in the blender for about 10 more seconds, just to combine. Pour the mixture into the pan with the melted sugar. Keep pouring. If you use the pan that I’m using here, it should end up about 3/4 full. Put the lid on the flan pan and use the buckles to seal it shut. (Be very careful! The sides and bottom of the flan pan will still be VERY hot.) Place the sealed flan pan in a large pyrex baking dish. Pour water into the pyrex dish until it reaches about halfway up the flan pan. Carefully place the pyrex baking dish in the preheated oven. Bake at 350 degrees for 1 hour and 15 minutes. Carefully remove pyrex dish from oven; the water and both pans will be very hot! Open the lid to the flan pan and check to see if it is done. The flan is done if it is “set” in the center. A toothpick inserted into the center should come out clean. If the toothpick is not clean or if the flan is very “jiggly” in the center, put it back in the oven in the water bath for about 15 more minutes. I overcooked mine a bit (see picture below), but it still had fabulous flavor and texture when I turned it out, so don’t worry too much about overcooking it a little. On the other hand, if you undercook the flan, it will fall apart when you try to move it to a serving plate. All that to say, if you’re not sure if the flan is set, it’s best to cook it a little more. When the flan is done, take the flan pan out of the water bath and let it cool completely. Then refrigerate the flan (still in the sealed flan pan) for at least 2 hours or overnight. To serve the flan, you will need a large plate with a lip to hold in the caramel. Right before you are ready to serve the flan, take off the lid to the flan pan. Run a butter knife around the outside edge of the flan to make sure the edges are loose. Then twist the pan back and forth quickly — the flan is loose if it moves freely within the pan. Now place the plate on top of the flan pan where the lid was. Holding the flan pan and plate tightly together, flip the plate and pan over so that the plate is on the bottom and flan pan is on the top. Carefully lift off the flan pan. 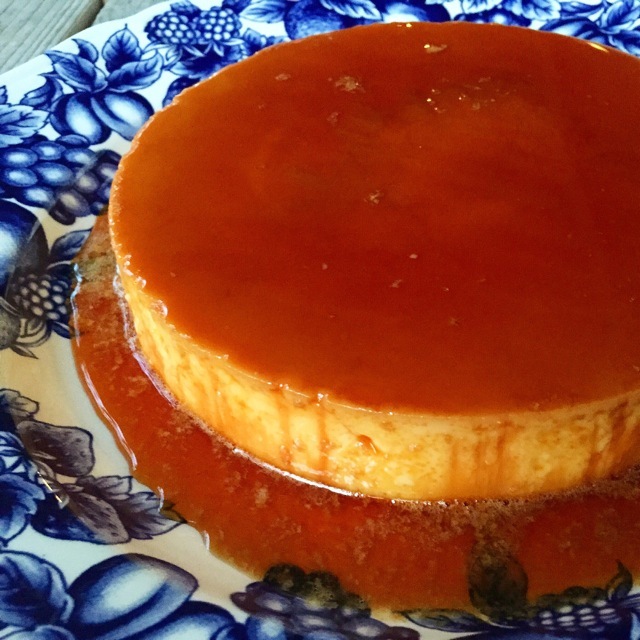 Your flan should be sitting in the caramel on the plate, ready to enjoy! Serve cold, with a spoonful of caramel on each plate. Top with whipped cream if desired. Marie, We finished your flan up tonight for dessert. It was amazing! Well enjoyed & very appreciated. Hi lovely Marie! this is Mary from @cooking_to_share on Instagram. I absolutely love flan, it’s one of my very favorite desserts! So of course, I came to check out your recipe when I noticed it on your profile link. As I was reading it and thinking about it being a traditional Mexican recipe dessert, I started wondering what they originally used instead of a can of sweetened condensed milk. Then I remembered one time when I was in Acapulco a friend there introduced me to an absolutely fabulous concoction called cajeta. Do you think the original recipe used that instead of sweetened condensed milk? No, I believe they just made their own sweetened condensed milk by slowly cooking sugar and milk over low heat. Rick Bayless uses this technique in his flan recipe. He swears it has a better flavor, but most of us don’t have the time or patience to make it ourselves. How long can the flan be stored cold before serving? I’m doing a large dinner for 40 people and want to do duck egg flan, so I’ll need to prepare ahead. Also… If I don’t have a flan dish will tinfoild or a tight lid work? hi Marie! saw your pic on IG and want to make this flan the right way! was about to buy the flanera you recommended but your link is not working. can you tell us which flan era to buy? I have made this recipe at least a dozen times. I bought the flan pan from Amazon and it’s perfect EVERY time. I make it exactly like the recipe. This is now one of my favorite desserts. I’m trying to get the flan to be that flat on top, but no luck! Any tips? Also, how long do you wait for it to cool down before placing it in the fridge? Love your blog, it’s very helpful and beautifully written! Made this today. Super easy! Waiting for it to cool down before I put it in the fridge. Should be ready by dessert time! Thanks for sharing! I followed your steps and my flan came out really good ,thanks for sharing . How do you get the hardened caramel in the bottom of the pan to come out? The liquid caramel comes out but there is still a lot in the pan. Wait, so can you make new flan with the old caramel in the pan? Or do you buy a brand new pan each time you make it? Hi! I’m eagerly wanting to try this flan recipe. I do not own a flanera but instead I have a 9-inch round baking pan. Should I cover the pan with aluminum foil or a metal pot lid during the water bath? Thanks for your help and I can not wait to make this recipe for my father! Thanks for the recipe. I’m planning on using small 3/4 cup souffle cups. In a 350 degree oven, does the cooking time change from 1 hr 15minutes? Also, do I just them uncovered? thank you. I plan to make them in a day or two. Hi would I get the same results adding cream cheese to my flan in this pan? Hi I love flan since I was a little girl in Mexico City. I was wondering now as an adult can I use something else besides sugar, I am diabetic. Please help. Hi, I just did my first fla, it came put delicious. one question, why did my flan came out with a dent in the middle you know what I am talking about??? Can you help me before Christmas? ??? How long in advance can I make flan? I followed your recipe and made this earlier this morning. It came out delicious, but since it was my first time making flan, I did have some difficulty. I made the Carmel from white sugar on the stove like you suggested but it hardens within seconds and it was really hard to spread across the pan without reheating the Carmel many times. So, I was wondering if there is a better substitute for the melted sugar or a different way to go about this? I heated my I heated my flan pan a little over lowheatbefore I poured in the cararmeled sugar. Worked fine for me. There are 2 things I have done to prevent the caramel from hardening so that you have a nice caramel sauce when inverting onto plate for serving. Adding a drop of lemon juice to the sugar keeps it from crystaling and hardening. OR a tablespoon of water added to the caramelized sugar immediately after it turns golden – swirl gently because it will bubble and spit and you don’t want to get burned! What great ideas! Thanks for sharing! I’ll try them both! I just made this using individual ramekins due to limited time to locate a flanera, and it turned out FABULOUS! It was my first attempt at making flan, and I could not be happier! Thank you so much for the tips of things to avoid and ensure doing in order to avoid the many flan disasters I have heard about and tasted myself! I see the the recipe calls for 1-1/4 cup of milk but next to that is says 14 oz. 1-1/4 cup is 10 oz. Which is correct? I was hoping to try your recipe tonight, but I want to get it right! Hi! Thanks so much for your question! The correct amount is 1 1/4 cup milk. I’ll fix the recipe now, thanks again! Turned out absolutely perfect and so delicious! This is a go-to recipe for sure. No doubt this is among the best of the best of flan you’ll ever eat! Thank you for sharing!!!! I tried making flan before but ended up failing. I will try again using this recipe and hopefully get better results. Thanks! Hi Marie – I picked up the flanera and I’ve made this twice – both times adding a teaspoon of vanilla extract – and it’s delicious. I’ve struggled with the mechanics of the caramel-making and making flan – with and without the flanera. I’ve got to where I know exactly when the caramel is finished and not burnt, so there’s no substantive problem, but getting caramel into the flanera can get a little wild. It sets so quickly and the flanera gets very hot very quickly when you introduce the caramel – I mean it’s burning hot and I’m still trying to spread the caramel around and the three locks on the flanera a very in-the-way! Any suggestions?? Thanks Maria, I will try flan recipe. You warned it gets very hot without a doubt! I’ll take care as if hot lava in a bucket. I feel prepared now, honestly thanks again. I just made this, with the suggested flanera, worked perfect. Can I use Dulce de Leche to coat the pan? can you double this recipe or do you suggest doing 2 individual one? and would the cooking time change if doubled? Thanks! Hi, everyone – I am a newbie to making flan and have analyzed a dozen recipes online. I have made it with 1 can of evaporated, not condensed milk plus 3/4 cup sugar in the custard mix, 5 eggs and 1 tsp. vanilla. Also, I learned on YouTube that you can make the caramel in the microwave! Put a cup of sugar in a Pyrex measuring cup, add a tablespoon or two of water to moisten into a very thick paste, and microwave on high for 5 minutes. It’s a bit syrupy and doesn’t harden immediately, so easy to work with. Thanks for all the helpful advice! How long do you cook if I bake in 6 oz custard cup. And do you spray pan before add sugar(caramel sauce)?